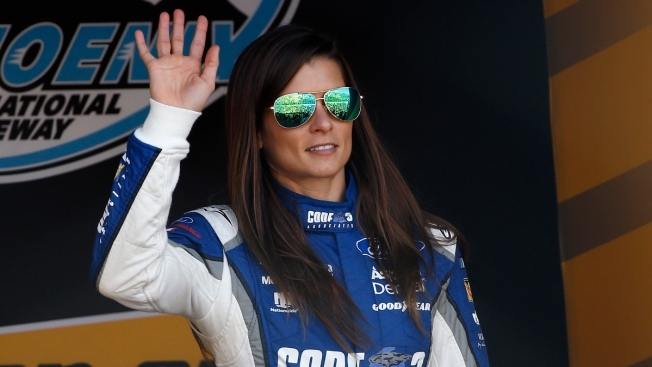 Danica Patrick broke down in tears Friday as she announced she will retire from full-time racing next year after running the Daytona 500 and then the Indianapolis 500, closing her career at the storied track that made her famous. Patrick told The Associated Press it took her many months to come to the realization her career is all but over. Once she accepted it, the idea of ending her career at Indianapolis Motor Speedway popped into her head. She told her agent, and she's been working on putting together "The Danica Double" over the last several weeks. "Nothing that was being presented excited me, then about three weeks ago, I just blurted out, 'What about Indy? Let's end it with the Indy 500,'" she said. "This ignites something in me. But I am done after May. Everyone needs to put their mind there. My plan is to be at Indy, and then I'm done." Patrick would not reveal who she will drive for in either race next year, but Chip Ganassi Racing is the likely ride at Indy. Ganassi has room to field additional cars — he's scaling down from four full-time cars to two next year — and would give Patrick a car capable of winning. Roger Penske and Michael Andretti both have full lineups announced for next year's Indy 500. Patrick will not be driving in the Daytona 500 for Stewart-Haas Racing, team co-owner Tony Stewart told AP. Patrick moved from IndyCar to NASCAR after the 2011 season, and has been racing Cup cars for SHR since 2012. She is being replaced after Sunday's season finale at Homestead-Miami Speedway by Aric Almirola. Patrick is the only woman to have led laps in both the Daytona 500 and the Indianapolis 500. Patrick ran the Indy 500 from 2005 through 2011. Her highest finish was third in 2009, and she was the first woman to lead laps in the race when she paced the field for 19 trips around the Brickyard as a rookie. Patrick was highly marketable early in her career even if success on the track was rare. She won the pole for the Daytona 500 in 2013, but finished 24th in the standings the last two seasons. She won her only IndyCar race in 2008, in Japan. Sponsorship trouble surfaced this year, too. When no strong opportunities for next season presented itself, Patrick decided to call it a career at Indy next Memorial Day weekend. "I think it's awesome and it will make for a huge month of May that she's back there," said Stewart, who spent half of his career trying to win the Indy 500. "It would be really cool to see her face on the Borg-Warner Trophy, if she can pull that off." Patrick had been adamant she would never return to IndyCar or the 500, but changed her mind as she realized her competitive options were dwindling. "I know I always said I'd never go back to Indy, and I was always being honest," she said. "Well, things change. I know now you can never say never. I'd been going through this in my head and kept asking myself, 'How am I going to get the words out and say it's over?' And trust me, I lost my (stuff) a few times over that. "But this seems right, and this seems good." Patrick told AP she had only informed about 10 people of her decision prior to Friday's announcement, where she wept openly as her family watched nearby. Everyone had been extremely happy with the path she's chosen. She said longtime boyfriend Ricky Stenhouse Jr. "has never been more excited about something about me in his life." Stewart praised Patrick for her time at SHR, and said his team would never have expanded to four cars without her assistance. Kevin Harvick will try to win a second championship in four years for the organization on Sunday, and Stewart said Patrick has been a huge part of the team's success. He was disappointed to learn she's ready to stop driving. "I am happy that she is doing it on her terms, but I am sad because I feel like there are wins under her belt that she can still get," he told AP. "I thought she'd go road racing or back to IndyCar or something along those lines, because I think that's where she can be successful." Patrick's fame was launched in IndyCar, and her relationship with former sponsor GoDaddy made her one of the most recognizable female athletes in the world. She currently has a winery in California, a line of athletic wear and an exercise and fitness program. Patrick said she'll have more time to spend on those ventures after the Indy 500. Her career crossroads was put in motion when GoDaddy first left auto racing after 2015, then new sponsor Nature's Bakery was unable to fulfill its three-year commitment to SHR and Patrick. The team has pieced together sponsorship all year, but has sponsorship for Almirola next year that made Patrick expendable. "I didn't want to be pushed into anything, and everyone can relate, sometimes things just shift and change around you," she told AP. "Especially with me and the sponsor situation. I've never been there before. I've always had a sponsor. It forces you into thinking about things and nothing was lining up easily. If I don't feel like I can run better than where I am, then I don't want to do it. And, there have been times that I could not have been more miserable. "That's not why I come, and I feel like it takes away from everything else I accomplished. I don't want to be remembered for the things that didn't go as well. I want to be remembered for the things that went well."